For other uses, see Tarentum (disambiguation). 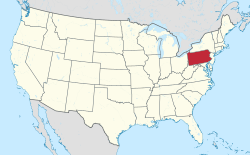 Location in Allegheny County and the U.S. state of Pennsylvania. Tarentum is a borough in Allegheny County in the U.S. state of Pennsylvania. It is 22 miles (35 km) northeast of Downtown Pittsburgh, along the Allegheny River. Tarentum was an industrial center where plate glass and bottles were manufactured; bricks, lumber, steel and iron novelties, steel billets and sheets, sack and wrapping paper were also produced. The Pennsylvania Railroad operated a station in Tarentum; its rail line ran through the town. The population was 4,530 at the 2010 census. Two statues of Hebe, the Greek goddess of youth, are displayed by the borough in Tarentum. Tarentum is located at 40°36′11″N 79°45′20″W﻿ / ﻿40.60306°N 79.75556°W﻿ / 40.60306; -79.75556 (40.603042, -79.755447). According to the United States Census Bureau, the borough has a total area of 1.4 square miles (3.6 km2), of which 1.2 square miles (3.1 km2) is land and 0.2 square miles (0.52 km2), or 12.06%, is water. The Allegheny River forms the borough's eastern border with Westmoreland County. Bull Creek joins the Allegheny River at Tarentum. Little Bull Creek joins Bull Creek via a culvert underneath Bull Creek Road (Pennsylvania Route 366) at Tarentum. Tarentum is bordered by East Deer Township to the west, Frazer Township to the northwest, Fawn Township to the north, Harrison Township to the northeast, and Brackenridge to the east. To the southeast, across the Allegheny River in Westmoreland County, are New Kensington (via Tarentum Bridge) and Lower Burrell. As of the census of 2000, there were 4,993 people, 2,170 households, and 1,306 families residing in the borough. The population density was 4,011.0 people per square mile (1,554.7/km²). There were 2,556 housing units at an average density of 2,053.3 per square mile (795.9/km²). The racial makeup of the borough was 93.79% White, 3.65% African American, 0.28% Native American, 0.60% Asian, 0.04% Pacific Islander, 0.26% from other races, and 1.38% from two or more races. Hispanic or Latino of any race were 0.90% of the population. There were 2,170 households, out of which 26.6% had children under the age of 18 living with them, 41.0% were married couples living together, 14.0% had a female householder with no husband present, and 39.8% were non-families. 34.2% of all households were made up of individuals, and 13.2% had someone living alone who was 65 years of age or older. The average household size was 2.28 and the average family size was 2.92. In the borough the population was spread out, with 22.0% under the age of 18, 8.8% from 18 to 24, 31.5% from 25 to 44, 22.0% from 45 to 64, and 15.8% who were 65 years of age or older. The median age was 38 years. For every 100 females there were 88.1 males. For every 100 females age 18 and over, there were 85.8 males. The median income for a household in the borough was $26,895, and the median income for a family was $32,042. Males had a median income of $28,578 versus $21,891 for females. The per capita income for the borough was $14,671. About 12.1% of families and 15.6% of the population were below the poverty line, including 24.1% of those under age 18 and 7.3% of those age 65 or over. In 1900, 5,472 people lived here; in 1910, 7,414 people lived here; and in 1940, 9,846 people lived in Tarentum. The population was 4,993 at the 2000 census. The Community Library of Allegheny Valley, Tarentum Branch, serves the borough and regional municipalities. Pittsburgh Mills in nearby Frazer Township uses a Tarentum postal code; it is the 22nd-largest shopping mall in the United States. Tarentum is within the Highlands School District, which operates Grandview Upper Elementary School (grades 3–5) in the borough; also Fawn and Fairmount primary centers (grades K–2), Highlands Middle School (grades 6–8), and Highlands High School (grades 9–12) in nearby communities. The Golden Rams are the Highlands School District's mascot. School tax millage rate- The Highlands School District (shared with Brackenridge, Fawn Township, Harrison Township and Tarentum) in 2017 was 23.80. This ranked 14th highest/most expensive out of Allegheny County's 45 school districts [between Mt. Lebanon SD (13th highest) and Cornel SD (15th highest)]. ^ Sipes, William B. (1875). The Pennsylvania Railroad: Its Origin, Construction, Condition, and Connections; Embracing Historical, Descriptive, and Statistical Notices of Cities, Towns, Villages, Stations, Industries, and Objects of Interest on Its Various Lines in Pennsylvania and New Jersey. Pennsylvania Railroad Company. p. 218. Retrieved 2010-06-01. ^ "Race, Hispanic or Latino, Age, and Housing Occupancy: 2010 Census Redistricting Data (Public Law 94-171) Summary File (QT-PL), Tarentum borough, Pennsylvania". U.S. Census Bureau, American FactFinder 2. Retrieved September 23, 2011. ^ "Bull Creek". Geographic Names Information System. 2009. Retrieved 2009-12-02. ^ "Little Bull Creek". Geographic Names Information System. 2009. Retrieved 2009-12-02. ^ "Population of Civil Divisions Less than Counties" (PDF). 1880 United States Census. U.S. Census Bureau. Retrieved 24 November 2013. ^ "Population-Pennsylvania" (PDF). U.S. Census 1910. U.S. Census Bureau. Retrieved 22 November 2013. ^ "Number and Distribution of Inhabitants:Pennsylvania-Tennessee" (PDF). Fifteenth Census. U.S. Census Bureau. ^ "Number of Inhabitants: Pennsylvania" (PDF). 18th Census of the United States. U.S. Census Bureau. Retrieved 22 November 2013. ^ "Pennsylvania: Population and Housing Unit Counts" (PDF). U.S. Census Bureau. Retrieved 22 November 2013. ^ "Annual Estimates of the Resident Population". U.S. Census Bureau. Archived from the original on 19 October 2013. Retrieved 22 November 2013. ^ "Community Library of Allegheny Valley". Retrieved 2010-08-11. ^ EL. "2012 Allegheny County election". Pittsburgh Tribune-Review. Retrieved 15 October 2017. ^ EL. "2016 Pennsylvani general election..." Pittsburgh Post-Gazette. Retrieved 15 October 2017. ^ EL. "Allegheny County Treasurer". Retrieved 1 September 2017. ^ C. Hale Sipe, The Indian wars of Pennsylvania : an account of the Indian events, in Pennsylvania, of the French and Indian war, Pontiac's war, Lord Dunmore's war, the revolutionary war, and the Indian uprising from 1789 to 1795; tragedies of the Pennsylvania frontier based primarily on the Penna. archives and colonial records, The Telegraph Press, Harrisburg PA, 1929. Chisholm, Hugh, ed. (1911). "Tarentum (Pennsylvania)" . Encyclopædia Britannica (11th ed.). Cambridge University Press. This page was last edited on 24 March 2019, at 18:26 (UTC).